The flagship device from YU for this year has been revealed from the invites sent out by the company itself. 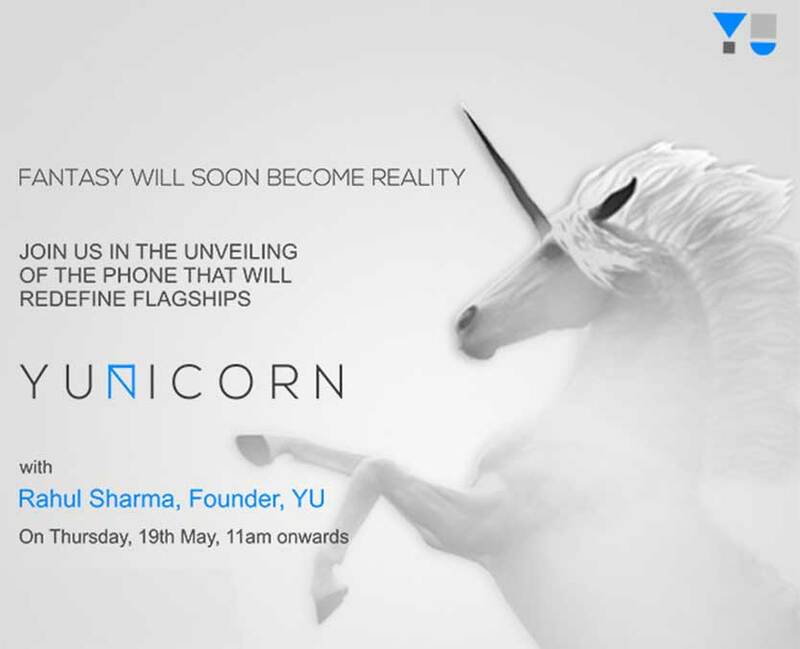 According to the invites, the upcoming flagship device will be launched on 19th May in an event that will be held in Delhi and the smartphone will be named as YU Yunicorn. According to the officials, Yunicorn will be one of the best device from YU with utter beauty and build quality. It will be packed with latest specifications and no compromise will be made with its performance. Overall it will a perfect combination of beauty and performance. As of now, there has been no official hardware details about the upcoming device, but it is expected that it will come with MediaTek Helio P10 chipset with octa core processor which is clocked at 1.8GHz accompanied with Mali-T860 MP2 GPU. It will have 4GB of RAM and will run the latest stable version of Cyanogen OS. Digging more about the device we found that YU Yunicorn might come with 16MP primary which can record videos in full HD. The display will also feature a full HD resolution of 1080 x 1920 pixels. Other than this it will have 4G support, Wi-Fi a/b/g/n, Bluetooth, FM Radio, GPS and 3.5mm audio jack. The battery and other specifications are still not know, but we will update this article as soon as we get to know the official specs sheet. The other premium features might include fingerprint sensors, metal body and USB Type-C port. Coming to the price, YU Yunicorn might come with a price tag of Rs. 24,999, but we still need to wait for the official announcement to go any further. The phone will be unveiled on 19th May 11AM on ward. To get more updates on YU Yunicorn and other upcoming devices, stay tuned with us.